Trio Fibonacci made its first appearance on the Canadian music scene in 1998, with the press reporting that “to hear them is to enter into the world of miracles” (Le Devoir, Montreal). 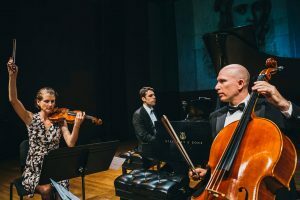 The Trio has been guided by some of the world’s most respected chamber musicians, including Menahem Pressler (Beaux Arts Trio), Eberhard Feltz and Michael Vogler, as well as members of the Alban Berg, Guarneri and Vermeer String Quartets. The Trio benefits from a brilliant international reputation, which brought them to perform in Argentina, Brazil, Chile, China, Japan, the United States, South Africa and many European countries. The Trio Fibonacci is one of the few piano trios recognized for its brilliant and inspired interpretations of contemporary repertoire as well as their passionate rendering of classical and romantic masterpieces. Since their beginning, they have premiered over fifty pieces from Canadian composers and have worked with many renowned international composers such as Pascal Dusapin, Henri Pousseur, Mauricio Kagel and Jonathan Harvey. Winner of the prestigious 2003 Virginia Parker Prize of the Canada Council for the Arts, given to underline her innovative contribution to contemporary Canadian music, Julie-Anne Derome studied with Christopher Rowland at the Royal Northern College of Music, UK, as well as with Mitchell Stern and members of the Emerson String Quartet in the USA. Early on, she gained recognition through her success in various competitions: she was awarded a special prize at the 1992 Yehudi Menuhin Competition in Paris for her interpretation of Anthèmes by Boulez, won first prize at the Mendelssohn Trust Award (UK) in 1994 and also first prize at the Emerson String Quartet Competition in 1995 (USA). In 1993, she took part in a concert of chamber music for Queen Elizabeth II in Cyprus. In 1996, Julie-Anne released a CD of twentieth century solo violin works on the Atma label and in reference to this recording the BBC Music Magazine hailed her as "a star in the making." Julie-Anne has been a guest artist at numerous international festivals including the Aldeburgh Festival (UK) on two occasions, Musica Strasbourg (France), Ultraschall (Germany), XIII Festival Música Contemporánea Chilena (Chile) and at the Huddersfield Contemporary Music Festival (UK). According to the magazine Musical Toronto "Prynn has a particularly silken bowing arm and remarkable control. Everything he played was poised, seamless and impeccably shaped." During his career as a soloist, as a member of the Trio Fibonacci and as a guest artist with diverse ensembles, notably the Ensemble Alternance in Paris, Gabriel has both resurrected forgotten masterpieces and premiered over sixty new works. Gabriel has performed at Toronto’s St. Lawrence Centre, Merkin Hall in New York, at the Musée d’Orsay in Paris in association with IRCAM and Radio-France, at the Aldeburgh Festival (UK) and at the Forbidden City Concert Hall in Beijing. Gabriel has collaborated with some of the most respected composers of our time such as Mauricio Kagel, Pascal Dusapin, Jonathan Harvey, Georges Aperghis, Hannah Lash, Georges Tsontakis and Henri Pousseur. His book “Apprivoiser le violoncelle” (Taming the cello), a guide to contemporary cello performance for students and composers alike, should be published in 2018. Steven Massicotte discovered the piano at a young age. He has recently completed Doctorate studies with Jean Saulnier in Montreal, as well as a post-graduate diploma in Vienna with Prof. Avedis Kouyoumdjian at the Universität für Musik und Darstellende Kunst Wien. He has performed with several orchestras including the Amadeus Orchestra in Poland under the direction of Anna Duczmal-Mróz, Orchestre philharmonique des musiciens de Montréal under Philipe Ménard, the Montreal University Orchestra under Jean-François Rivest, and the Sinfonia de Lanaudière under Stéphane Laforest in Québec. Steven is a laureate of numerous competitions, and recently was the laureate of the OPMEM (Orchestre philharmonique des musiciens de Montréal) concerto competition and played the 3rd piano concerto by Rachmaninov with the same orchestra last September. In 2015 he won the 2nd prize at the International Chamber Music Competition of Malta with duo Schaeffer-Massicotte. In 2013 he won 3rd Prize at the International Chopin Competition in Mariánské Lázně, Czech Republic. In 2011, he was awarded the Prix Joseph-Rouleau for the best Quebec artist at the Concours musical international de Montréal, which brought him concert engagements in London and Berlin for Québec’s National Day.